Pole Height: 16". Horizontal Range: 14" from back of Pole. Base Dimensions: 9.5" W x 10.5" L. Base Weight: 10 lbs. 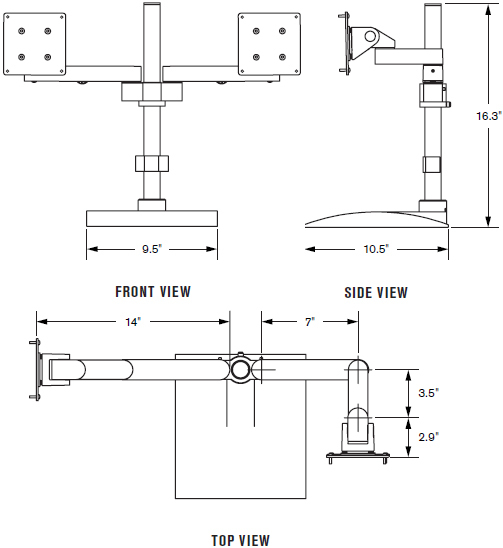 Model 9113 is a free-standing LCD mount which suspends 2 monitors above the work surface. Monitors may be independently pivoted and tilted for comfortable viewing. The 90° rotating pivot feature allows you to view the LCD in either landscape or portrait format. The weighted base enables quick setup - no drilling or mounting required. Position monitors at desired height along 16" pole. Monitor tilter mechanisms can tilt over 200 degrees. Aluminum base provides a secure platform.